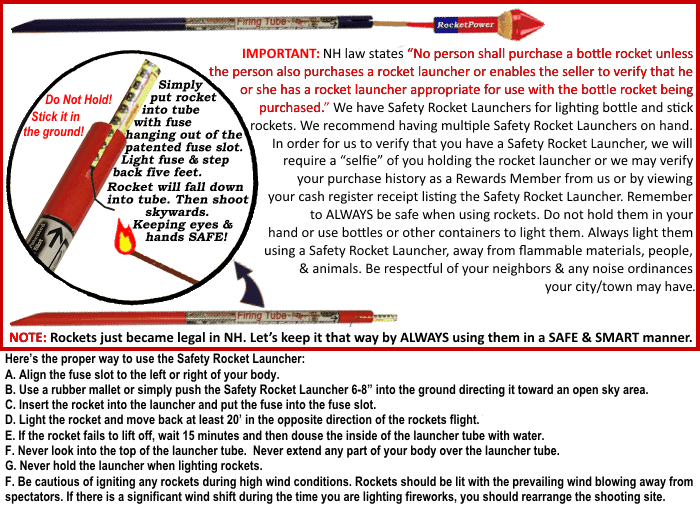 Fireworks Safety – Safety First! Adults 21 years of age or older (18 or older with an active Military ID) – may purchase, possess, and display permissible fireworks. Permissible fireworks may only be displayed on property you own, or you must have written permission from the landowner. Be considerate of your neighbors, pets and the environment – You could be liable for damages to another’s property. Follow Local Laws and Use Common Sense – Follow your local and state laws regarding the display and possession of fireworks. Make certain to read and follow all directions, caution labels and warnings labels on each individual firework device and use good common sense when using fireworks. Children Should Never Handle Fireworks – Never allow children to handle, play with and/or light any type of fireworks. Not even sparklers! Fireworks burn very hot and are only intended to be handled by adults. Do Not Consume Alcohol With Fireworks – Do not consume alcohol while handling fireworks. Fireworks must be used by adults who act in a responsible manner and are not under the influence of alcohol or drugs. Use Fireworks In A Clear, Open Area – Always light fireworks in a clear, open area free of overhead objects. Always provide a safe distance between buildings, vehicles and any viewing audience. A minimum clear radius of 30 feet for fountains and other ground-based items and 100 yards for any aerial based firework is recommended. Avoid using fireworks in an area where there is dry brush or grass or other flammable items that could catch fire. We recommend using a piece of plywood on a flat surface as a base to light all 500 Gram Aerials, Aerial Repeaters, Fountains, Saturn Missiles, Single Shot Tubes, Nine Racks, and Helicopters. Next, use several pieces of Gorilla duct tape to tape from the side of the above items down (excluding helicopters) onto the piece of plywood. (DO NOT TAPE OVER THE TOP!) This stabilizes your firework and helps to prevent it from tipping over. Light ground based items like Firecrackers, Jumping Jacks, Ground Bloom Flowers, Crackling Balls, Tanks, etc. on a flat open parking area away from homes, buildings, cars, animals or combustible materials. When lighting Roman Candles, place them in a bucket of sand. Do not hold them in your hand! Reloadable shells are a two piece system consisting of a shell or canister shell and a mortar tube. A single shell is placed inside the mortar tube in the upright position with the fuse leading out of the tube. Mortar shells that are round on the top and flat on the bottom should have the flat part of the shell in the bottom of the mortar tube. Canister shells have an arrow on the side of them and the arrow should be facing up. **It is important to note: at no time should you place your face, hands or any body part over the mortar**. The mortar tube needs to be secured on a hard flat surface by placing them in a five gallon bucket of dry sand filled within two inches of the top of the mortar tube. Cover the top of the tube when adding sand to prevent sand from getting inside the tube. Duct tape will NOT sufficiently secure a mortar and prevent it from falling over. Wait at least two minutes before reloading. If after two minutes, you still see smoke in the mortar tube, wait until the smoke clears. Follow the manufacturer’s specifications and only use the shells and mortar tube that came in the shell kit. Each tube is to be disposed of properly upon finishing the box of shells. Example: a shell kit comes with 12 shells and 2 mortar tubes. Upon finishing 6 shells in a mortar tube, the mortar tube should no longer be used. The over-use of a mortar tube will increase the hazard of the tube failing and an accident occurring. Do not use PVC pipe as a mortar. Do not make your own mortar tubes. Keep Clear Of The Fireworks – Never extend any part of your body over the top of any firework product. Wear a long sleeve shirt, pants, and gloves. Never look into the top of a lighted fireworks item. Never hold any lighted firework item in your hand. Never shoot fireworks in a glass or metal container. Use Care When Lighting Fireworks – Always light fireworks with a Pyro-torch, flare or an extended butane lighting device which will enable you to keep as far from the firework as possible. Use a flashlight at night so the fuse may be seen easily. Never use a lantern or other flame producing device near fireworks for illumination. Light the firework and get away quickly. Keep items that you are about to light covered in a box and away from the firing area. Light One At A Time – Always light only one firework item at a time. Don’t Use Malfunctioning Items – Never attempt to re-ignite, alter, or fix any fireworks device which has failed to fire. If a firework fails to ignite, let it stand for at least fifteen minutes, then immerse it in water. Dispose of the item properly. Do not alter fireworks – Never take apart or attempt to alter any firework. Do not make your own fireworks. Have Water Close By – Always have a form of fire suppression nearby. (Fire extinguisher and hose; bucket of water to douse sparklers). There should always be one person whose sole job it is to be alert to any emergencies. Douse all fired and used fireworks with water at the end of your display. Do not store used and fired fireworks inside or near any buildings or structures. Windy Conditions – Be cautious of igniting any fireworks during high wind conditions. Fireworks should be lit with the prevailing wind blowing away from spectators. If there is a significant wind shift during the time you are lighting fireworks, you should rearrange the shooting site. Never Use Fireworks As A Weapon – Never aim, point, throw, or shoot fireworks at another person or animal. Use Care When Handling Fireworks – Do not carry fireworks in your pocket. Never smoke when handling fireworks. Storage Of Fireworks – Always store fireworks in a cool, dry place and dispose of them properly. Only Use Fireworks Outdoors – Never use fireworks indoors! Purchase Fireworks From Reliable, Licensed Dealers – Buy fireworks only from reliable, licensed fireworks dealers. Licensed and reliable fireworks dealers will only carry those products that meet standards set by the U.S. Consumer Product Safety Commission. Safety glasses and ear plugs are recommended when lighting fireworks and for those individuals in close proximity to fireworks. Do Not Transport Fireworks on Airplanes – It is a violation of Federal law to transport any fireworks on an airplane. What is a festival ball or reloadable shell? Festival balls and reloadables are a two piece system consisting of a shell or canister shell and a mortar tube. A single shell is placed inside the mortar tube in the upright position with the fuse leading out of the tube. Mortar shells that are round on the top and flat on the bottom should have the flat part of the shell in the bottom of the mortar tube. Canister shells have an arrow on the side of them and the arrow should be facing up. **It is important to note: at no time should you place your face, hands or any body part over the mortar**. Why would a person choose reloadables in addition to aerial cake fireworks? Reloadables are an excellent addition to any fireworks show. It allows the shooter to extend their budget and the time of their display. It also allows the shooter to feel like a professional pyrotechnician by loading his/her individual shells. This allows the shooter to truly customize their show. Who should be lighting reloadables? The person lighting them should be at least 21 years old and be healthy enough to quickly retreat from the lighting area to provide for greater safety. Always consider the location, making sure to follow the same rules as you would use firing any aerial firework. A hard flat surface with the proper safety distance is 300’ X 300’. The base of the mortar needs to be secured on a hard flat surface by placing them in a five gallon bucket of dry sand filled within two inches of the top of the mortar tube. Make sure the mortar base is covered with sand. Duct tape will not sufficiently secure a mortar and prevent it from falling over. How long should I wait before reloading shell or canister into the mortar tube? Wait at least two minutes. If after two minutes, you still see smoke in the mortar tube, wait until the smoke clears. How many times can I use one mortar tube? It is our recommendation that you follow the manufacturer’s specifications and only use the shells and mortar tube that came in the shell kit. Each tube is to be disposed of properly upon finishing the box of shells. Example: a shell kit comes with 12 shells and 2 mortar tubes. Upon finishing 6 shells in a mortar tube it should no longer be used. The over-use of a mortar tube will increase the hazard of the tube failing and an accident occurring. What should I use to light them? It is best to use a grill stick lighter or torch lighter.